The ultra high-tech LAB-ID, plus new Submersibles as well as watches for the 2017 America's Cup. 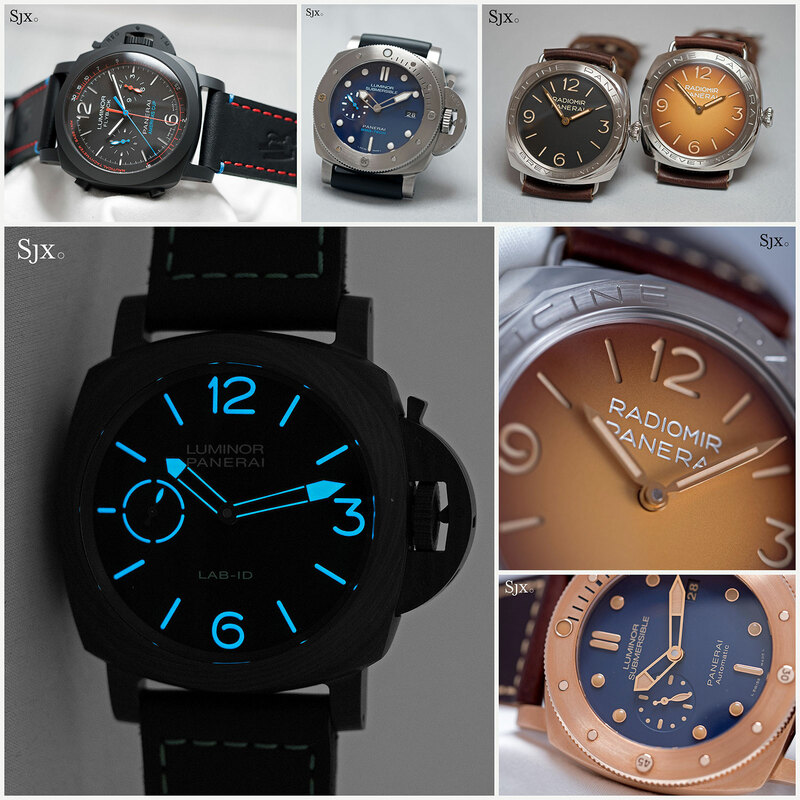 Panerai‘s line-up at SIHH 2017 was unusual in being largely contemporary in feel, instead of heavily relying on vintage styling as is the brand’s habit. 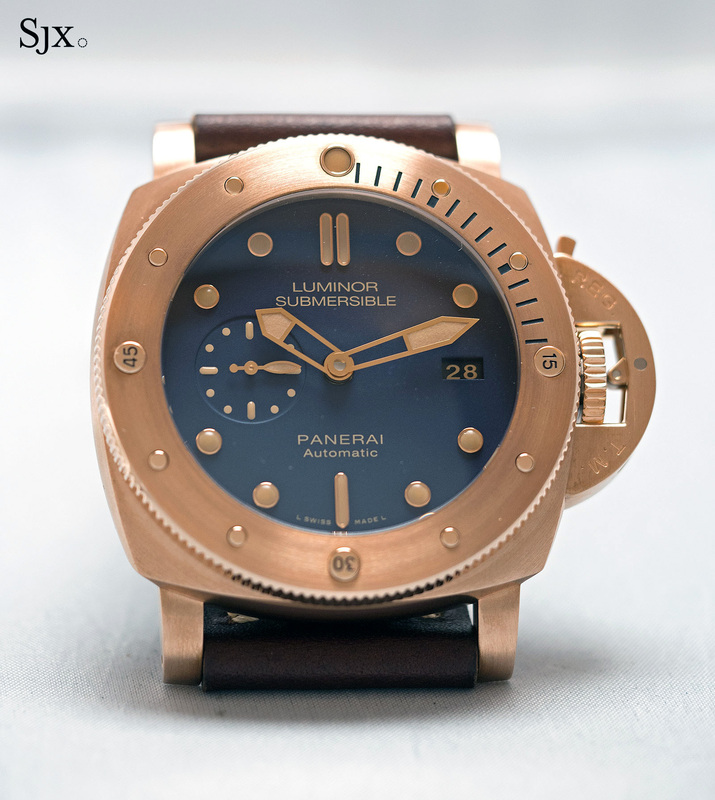 The collection was headlined by the experimental LAB-ID Luminor 1950 Carbotech, but primarily focused on new Luminor Submersible models, including the latest Submersible Bronzo. 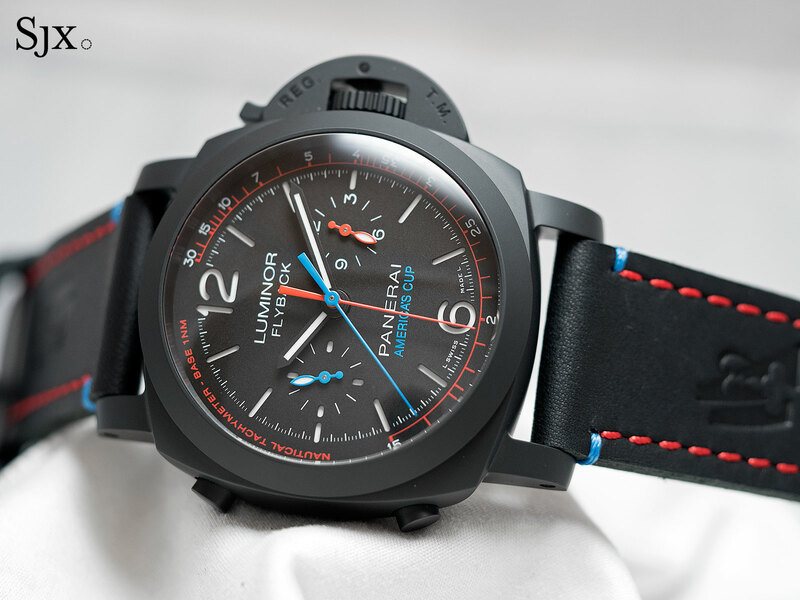 There were a handful of intriguing watches shown but not officially unveiled, including new Luminor Due variants and a Mare Nostrum chronograph based on the 42mm Pre-Vendome model, the PAM00719. But let’s get on with the watches that were introduced. 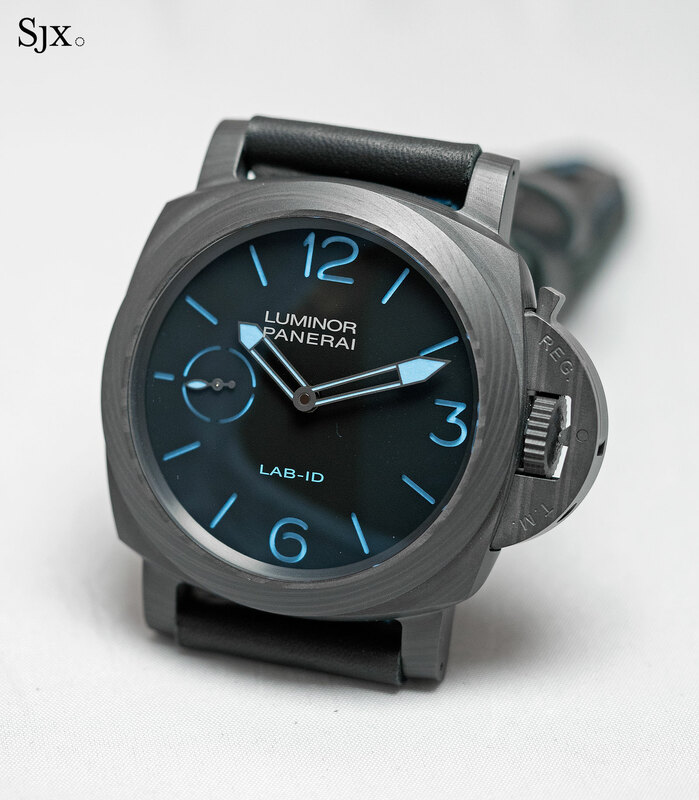 The LAB-ID Luminor 1950 Carbotech 3 Days PAM00700 is an intriguing beast packed with technical innovations, backed by a 50-year warranty. 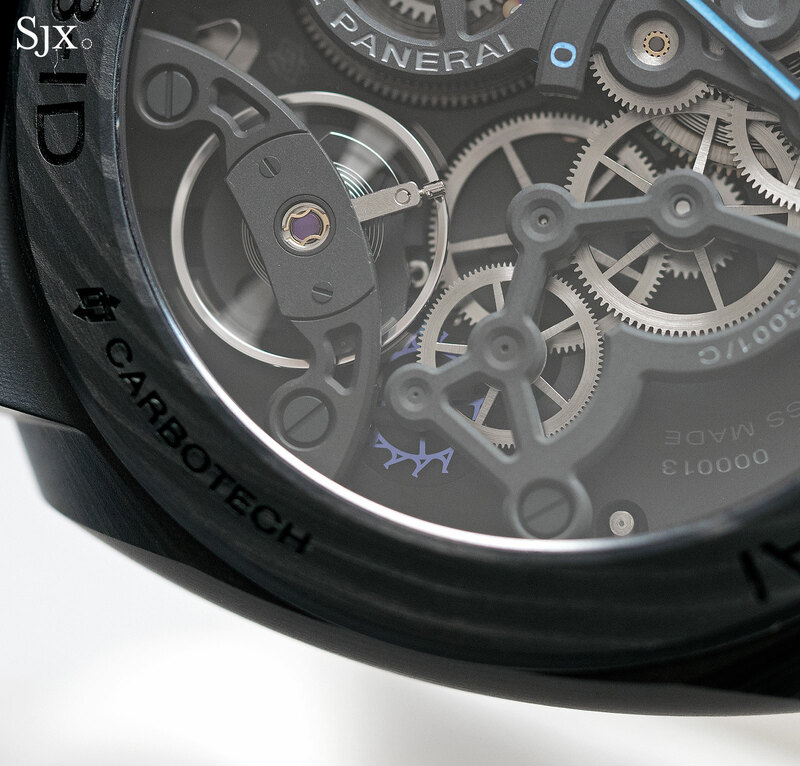 Most of the features of the watch are carbon-related, starting with the 49mm Carbotech case. 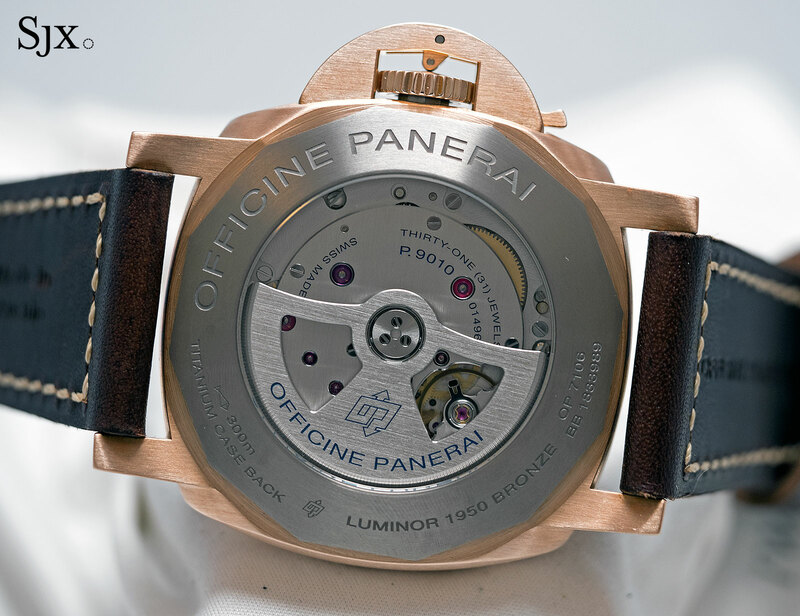 Essentially a type of carbon fibre-reinforced polymer that’s produced by layering sheets of carbon to create a woodgrain appearance, Carbotech has been used by Panerai several times in the past. 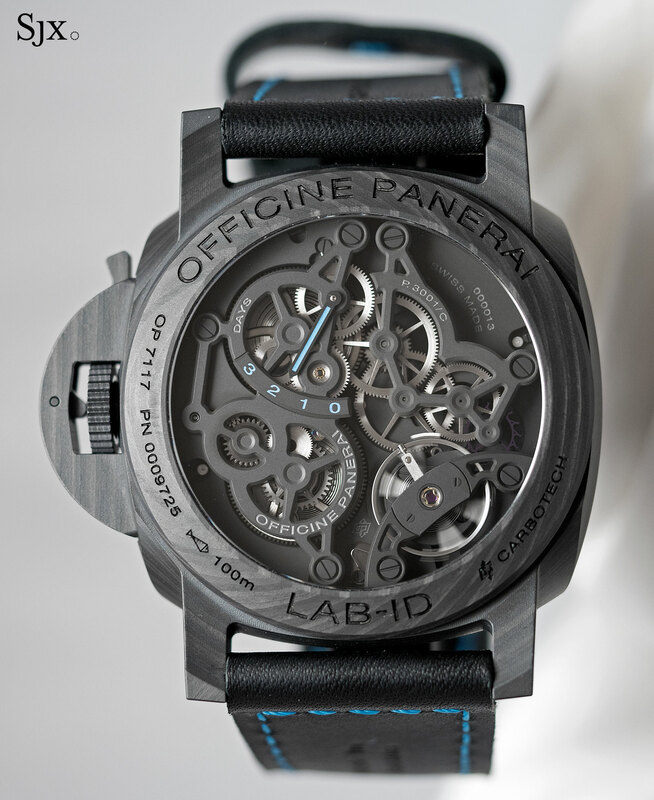 Add to that a carbon nanotube coating on the dial that gives it a deep, flat black colour. 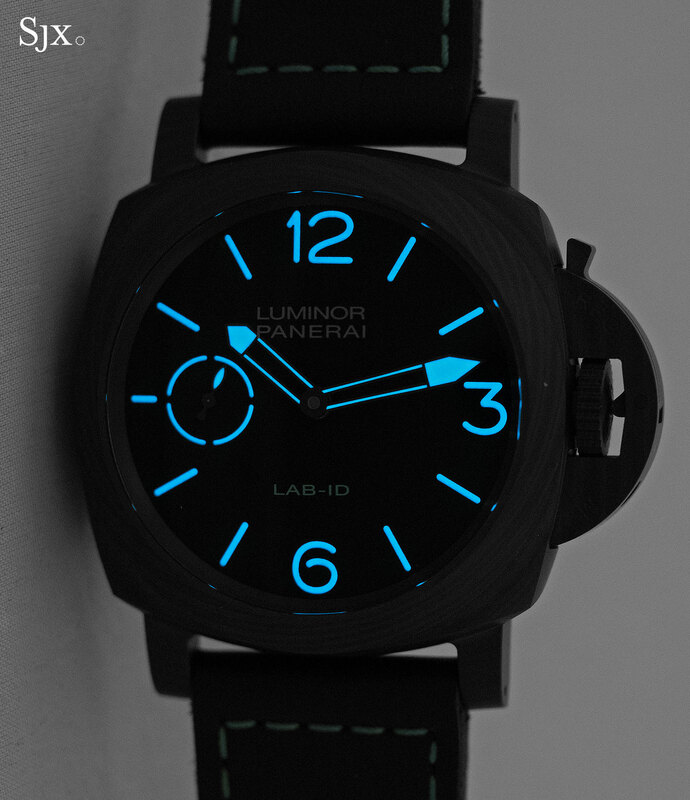 Constructed in the sandwich manner typical of Panerai, the dial sits over a plate painted with blue Super-Luminova below, illuminating the hour marker cut-outs from below. The movement inside is where it gets more interesting – though it has to be said many of the technical features are not entirely new as Breitling did similar (and arguably more in fact) with last year’s Chronoworks. Based on the hand-wound P.3000, the calibre P.3001/C inside the LAB-ID has the base plate and bridges made of ceramic, allowing all the pivots to sit inside them, since ceramic is almost friction-free. Both the pallet fork and escape wheel are silicon, while the wheels of the gear train are coated in diamond-like carbon. Even the four jewels for the balance staff are coated in DLC. This allows all the moving parts to operate with almost zero friction, eliminating the need for lubrication. For the same reason, the insides of the barrels are also DLC coated, so the usual grease needed to smoothen the movement of the mainspring is done away with. The P.3001/C has a 72-hour, or three day, power reserve, the same as the standard P.3000 movement. But pulling the crown on the LAB-ID stops the balance and sends the seconds hand back to 12 o’clock, allowing for precise time setting. This zero-reset hacking seconds is not found on the basic P.3000 calibre. 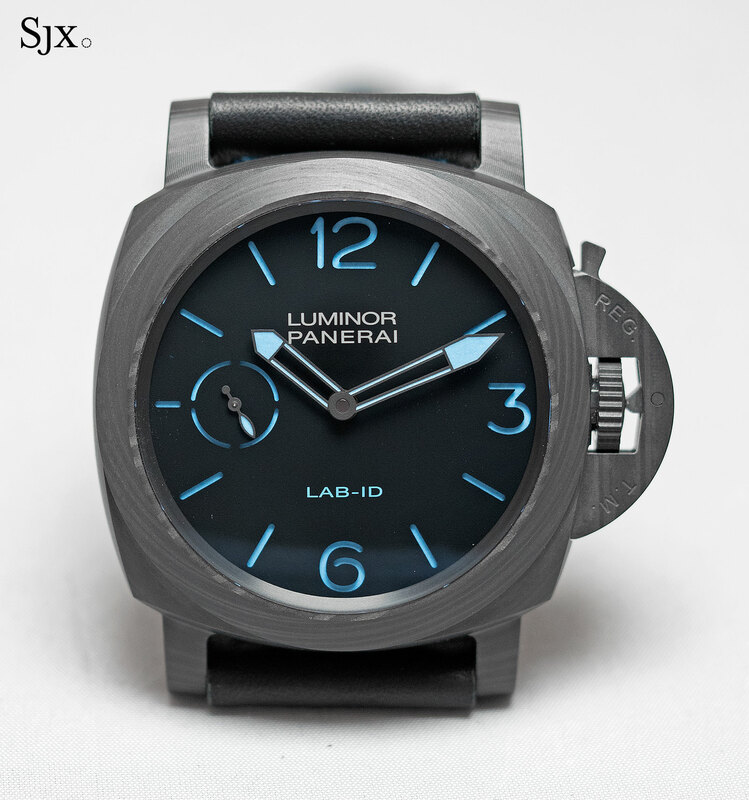 The LAB-ID Luminor 1950 Carbotech 3 Days (PAM700) is a limited edition of 50 pieces, priced at €50,000. A key segment of the new collection is half a dozen new Submersible watches, starting with the Luminor Submersible 1950 3 Days Automatic Bronzo PAM00671. 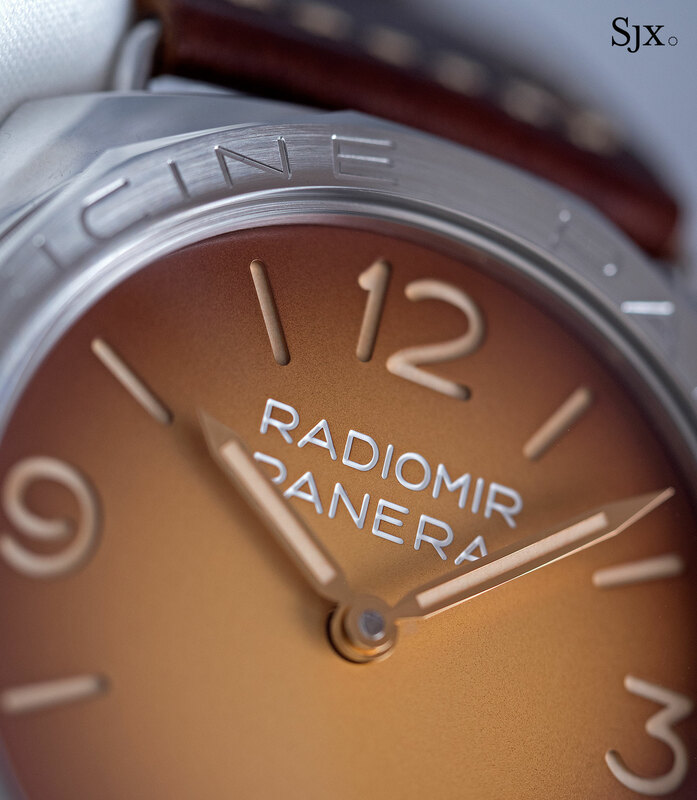 This is the third watch with a bronze case introduced by Panerai, following the PAM382 of 2011 and the PAM507 that came in 2013. Given the success of the last two, which now sell for hefty premiums over the original retail, the third Bronzo is unsurprising. 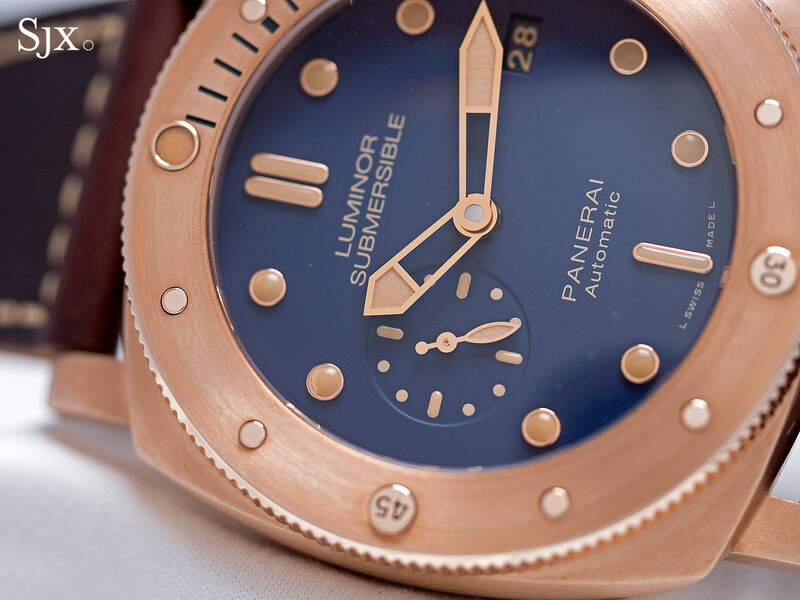 While the first two Bronzo watches had green dials, the latest model has a dark blue dial. 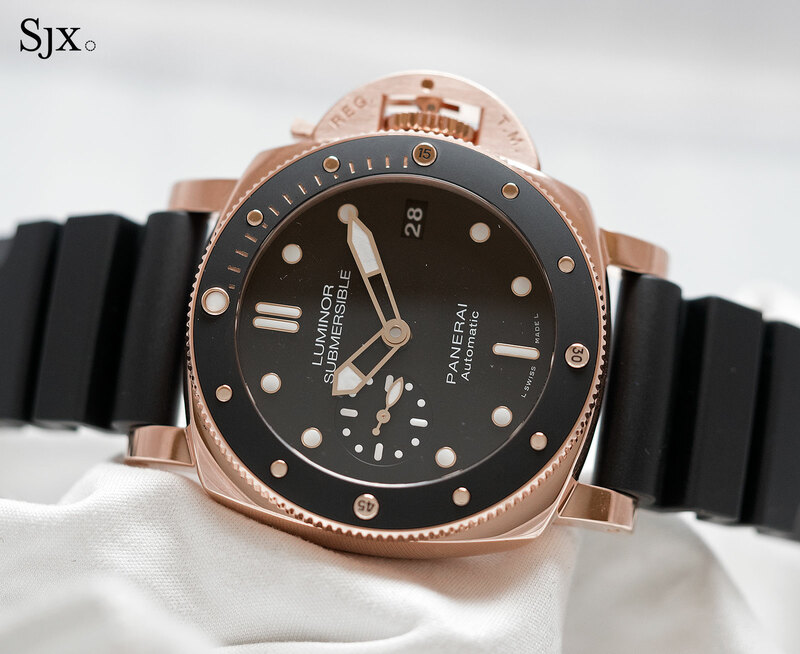 The rest of the watch is largely identical to before, with a 47mm case made of a copper-tin alloy typically used for marine applications like propellors. Exposure to air causes surface oxidisation, creating a brownish-green patina over time, the defining characteristic of bronze watch cases. 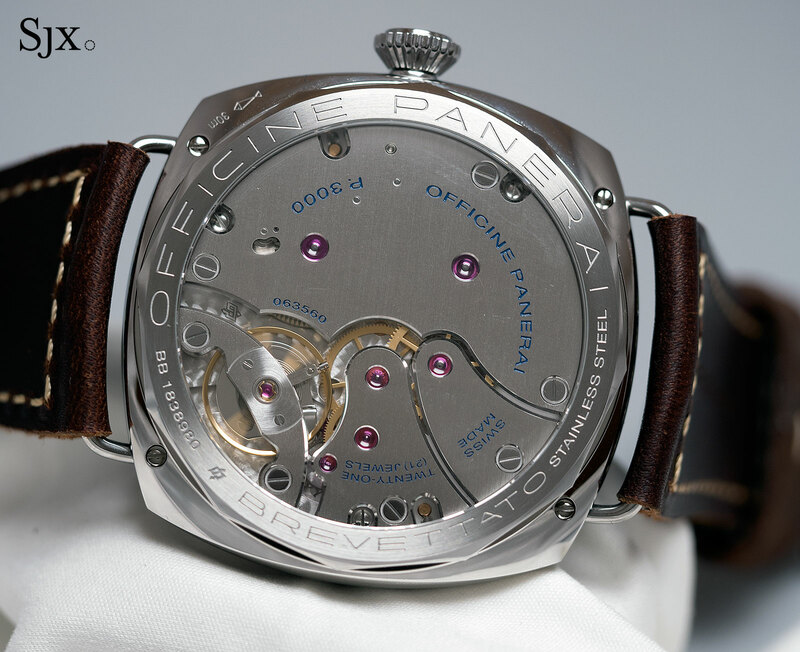 And the movement inside is the P.9010, a self-winding movement with three day power reserve. 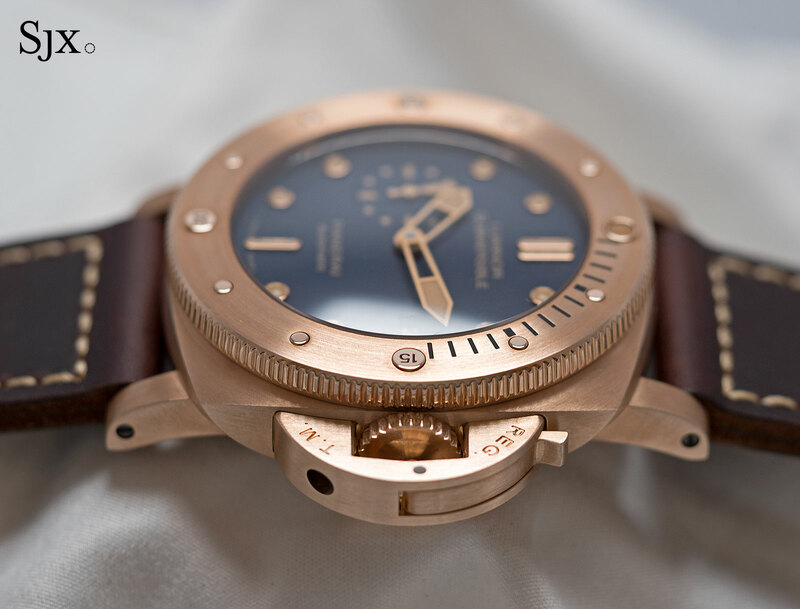 Limited to 1000 pieces, the Luminor Submersible 1950 3 Days Automatic Bronzo PAM671 will cost US$14,400 or S$20,600. Powered by the same calibre P.9010 but with an arguably more interesting case material, the Luminor Submersible 1950 BMG- TECH 3 Days Automatic PAM00692 has a case made from bulk metallic glass, hence the “BMG” moniker. Bulk metallic glass is essentially a metal alloy (here composed primarily of zirconium, along with copper, aluminium, titanium and nickel) that’s rapidly cooled during production, leaving the atoms of the alloy arranged irregularly, just like glass. In contrast, in ordinary metal alloys the atoms are arranged in an orderly, crystalline structure. The irregular atomic structure of metallic glasses, also known as amorphous metals, give them high wear and corrosion resistance, as well as superior toughness. 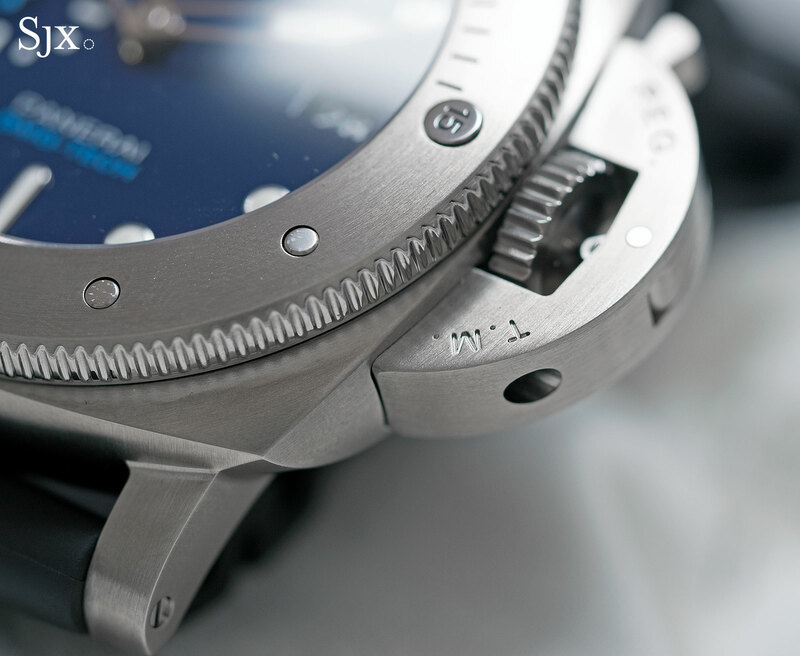 In the metal the BMG-TECH Submersible resembles titanium, and feels similarly lightweight. 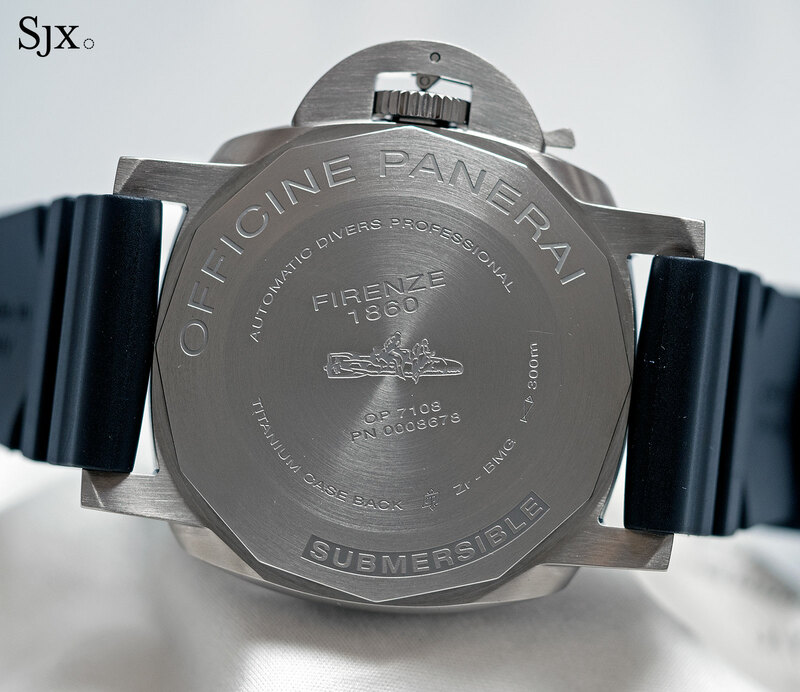 The case is the standard 47mm size for the Submersible, and matched with a dark blue dial. It costs US$10,200 or S$14,600. Two unusual Submersibles were also introduced, both being a 42mm in size. 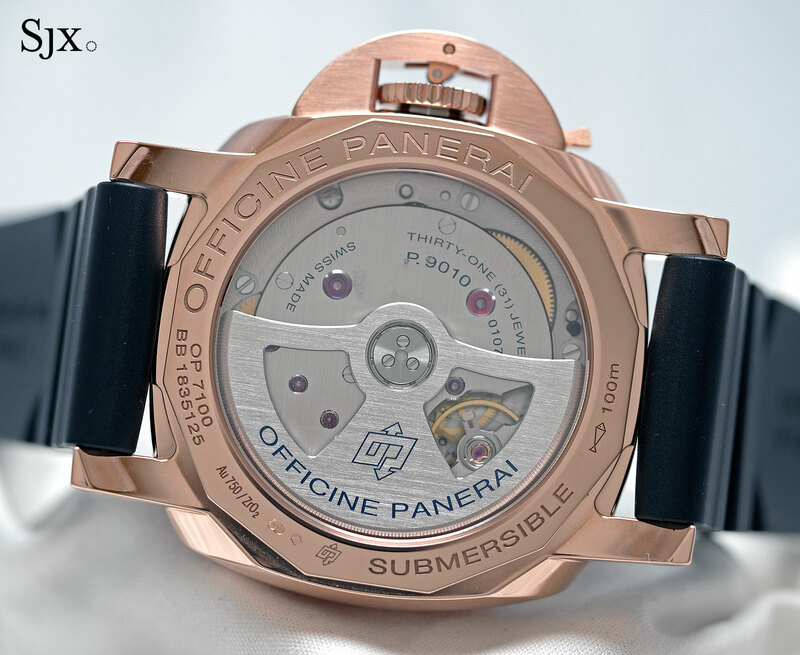 Both are equipped with the same P.9010 movement found in the 47mm watches above, but with significantly smaller cases; tiny, in fact, compared to the average Submersible. Like the extra-thin Luminor Due, these are more wearable and presumably help broaden Panerai’s appeal beyond its traditional audience. The fancier of the two is the Luminor Submersible 1950 3 Days Automatic Oro Rosso 42mm PAM00684 that has an 18k red gold case. The case is mirror polished on all surfaces, except for the crown lock bridge, though the shine of the case is moderated by the matte black ceramic bezel insert. The colour and size of the red gold Submersible give it the feel of a ladies’ watch. It costs US$26,700 or S$38,100. 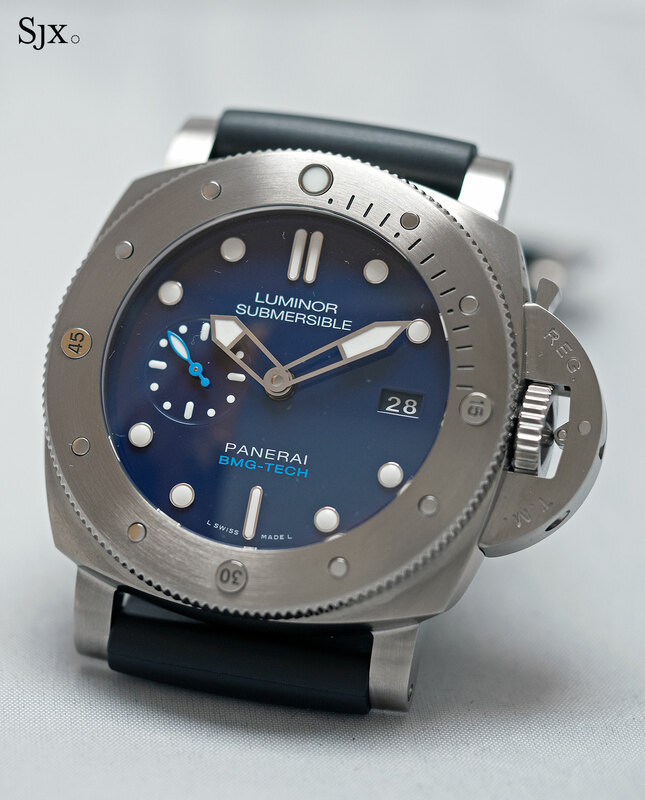 The other 42mm model is the Luminor Submersible 1950 3 Days Automatic Acciaio 42mm PAM00682, which is the same but in stainless steel with a steel bezel. This is priced at US$8700 or S$12,500. The rest of the SIHH offerings were dominated by watches produced for the 35th America’s Cup that will take place in Bermuda in June 2017. 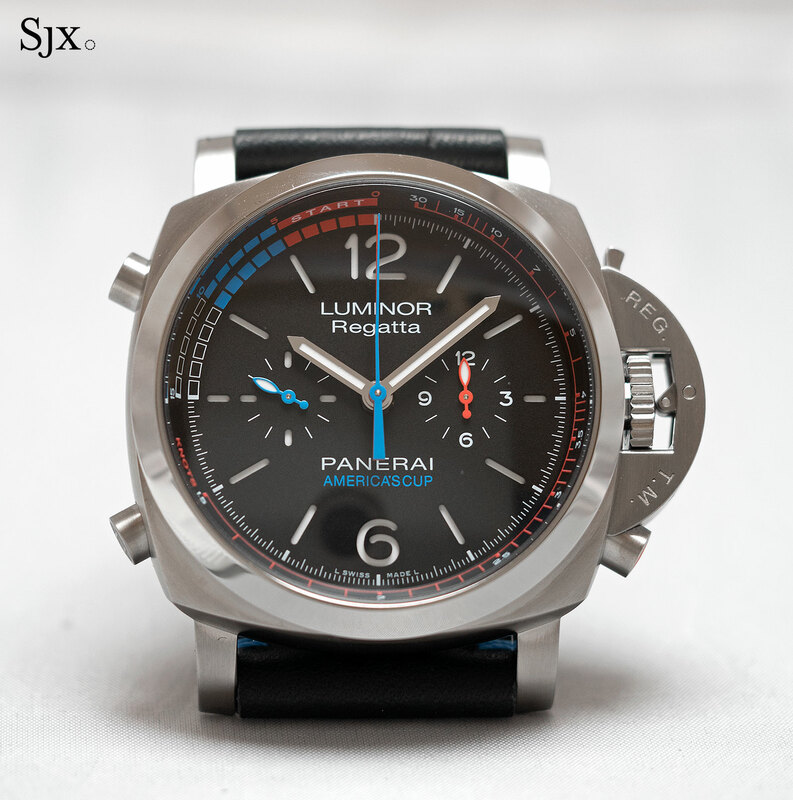 Panerai is the official partner of the yacht race as well as the official partner of two of the competing teams, defending champion Oracle Team USA and challenger SoftBank Team Japan. The result is five limited editions watches for the race and the teams. 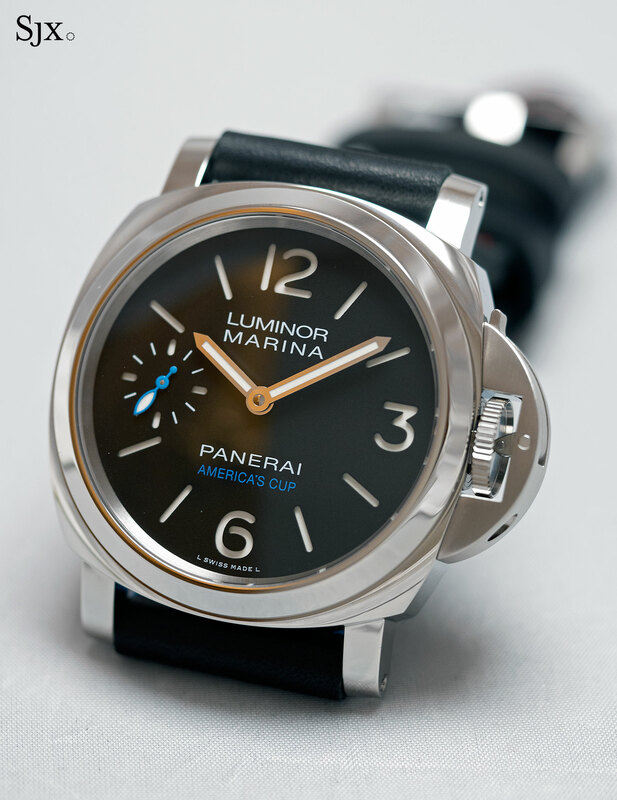 The basic model is the official watch of the event, the Luminor Marina 1950 America’s Cup 3 Days Automatic PAM00727. Limited to 300 watches, this is powered by the P.9010 movement with blue and red accents that echo the logo of the America’s Cup. 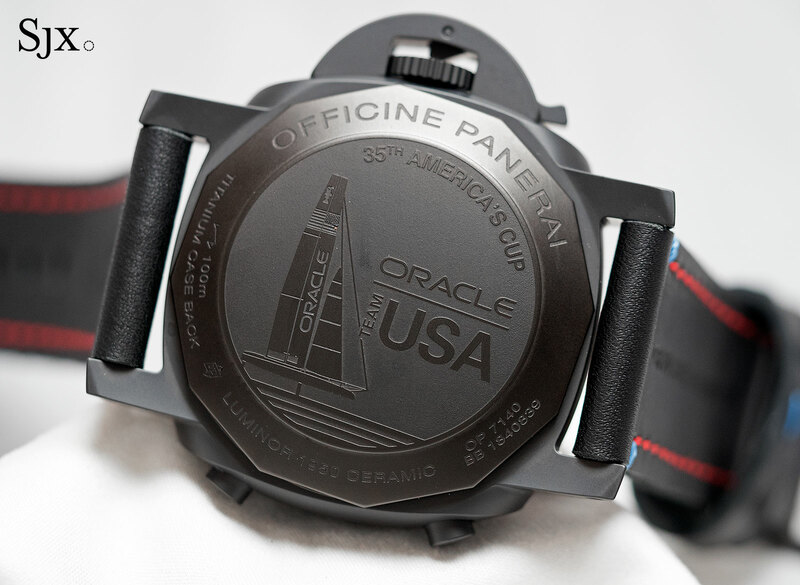 The steel case is 44mm in diameter, with a solid back bearing the America’s Cup logo. 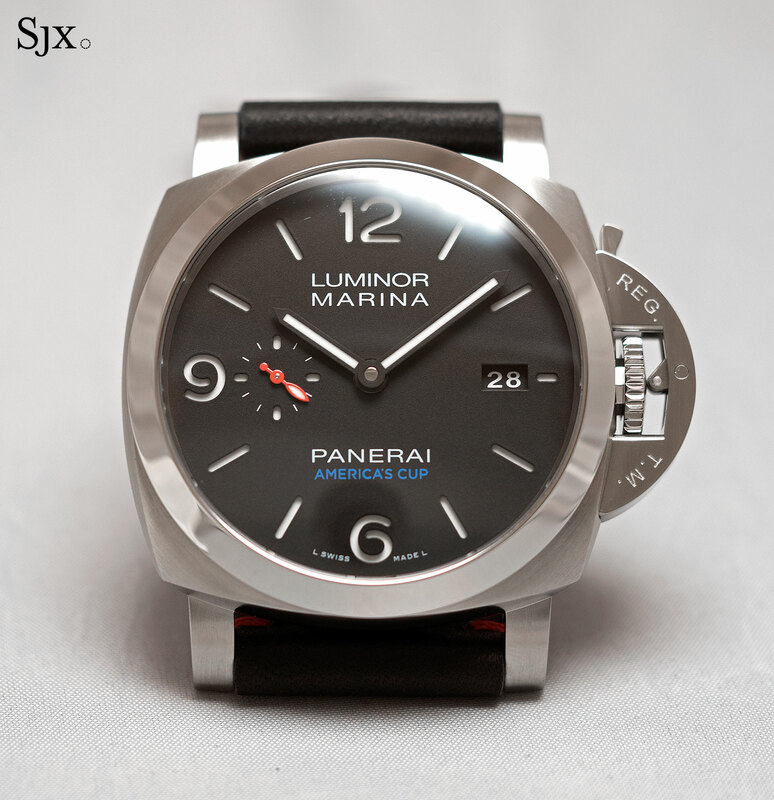 The Luminor Marina 1950 America’s Cup 3 Days Automatic PAM727 costs US$8100 or S$11,600. The next three watches were conceived for Oracle Team USA, which means the logo of the American software company adorns all the case backs. The first is the Luminor 1950 ORACLE TEAM USA 3 Days Chrono Flyback Automatic Ceramica PAM00725, which has a 44mm, matte black ceramic case. Instead of the usual tachymetric scale graduated for land speed, the Oracle Team USA chronograph has a nautical tachymetre calibrated for 1 nautical mile, allowing the user to calculate the speed of a vessel travelling over a nautical mile. Inside is the P.9100, an automatic movement with a flyback chronograph and three days power reserve. The price tag on this is US$15,300 or S$21,950. Another chronograph is the Luminor 1950 Regatta ORACLE TEAM USA 3 Days Chrono Flyback Automatic Titanio PAM00726. With a titanium case that’s 47mm in diameter, this is equipped with a Regatta countdown function controlled by the pusher at four o’clock. Each press of the button moves the central red countdown hand backwards by one minute, allowing the user to set a countdown time for a yacht race. The pusher at 10 o’clock starts and stops the chronograph, while the button at eight o’clock resets everything. And like the ceramic chronograph above, this also has a nautical tachymetre around the dial, calibrated for a nautical mile to measure speed in knots. Limited to 200 watches, the Luminor 1950 Regatta ORACLE TEAM USA 3 Days Chrono Flyback Automatic Titanio PAM726 costs US$17,900 or S$25,600. 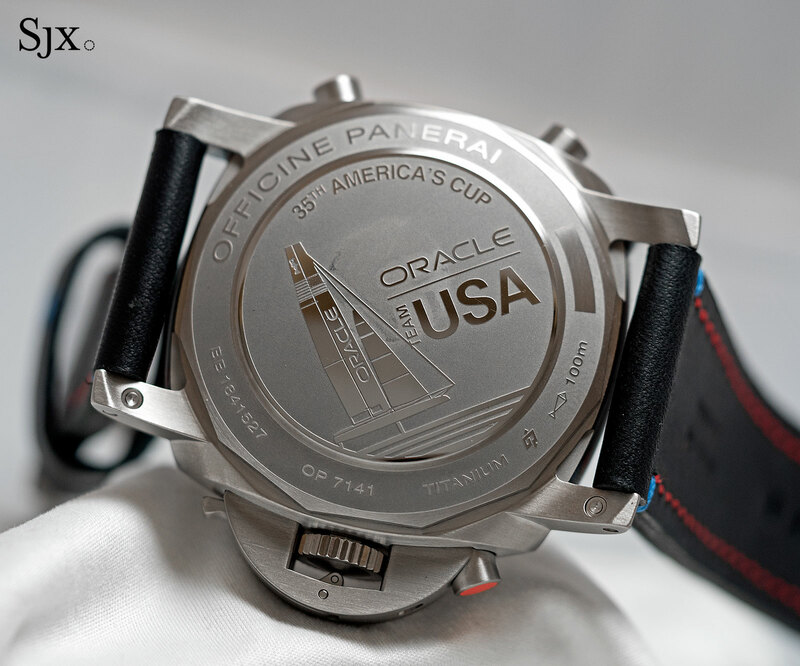 The simplest of the America’s Cup watches is the Luminor Marina ORACLE TEAM USA 8 Days Acciaio PAM00724. Time-only and stainless steel, this has the basic 44mm Luminor case, with the P.5000 inside, a hand-wound movement with an eight-day power reserve. This is a 200-piece limited edition, priced at US$7100 or S$10,150. 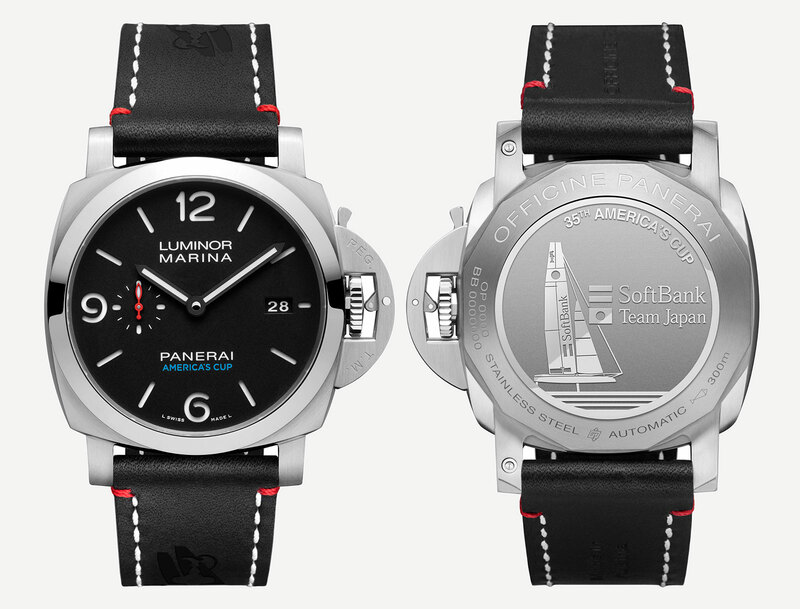 And for those who prefer the logo of a Japanese software company, the Luminor Marina 1950 SOFTBANK TEAM JAPAN 3 Days Automatic Acciaio PAM00732 provides just that. 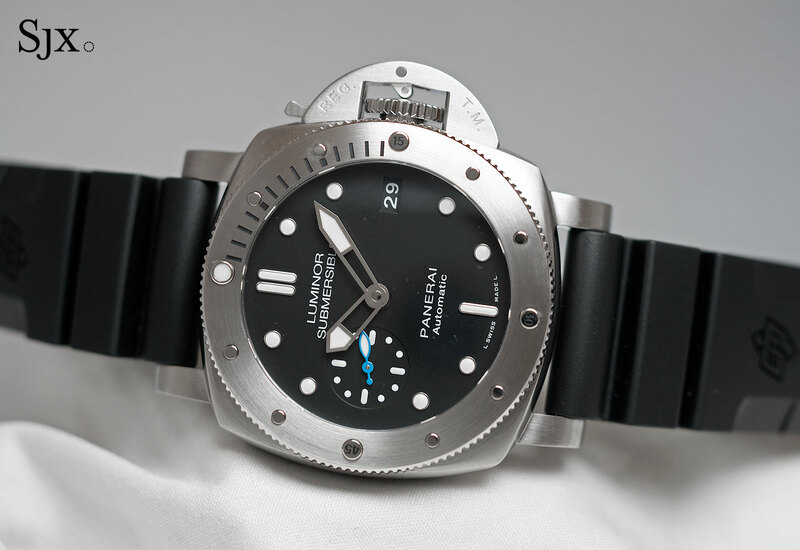 Identical to the PAM00727 that’s the official watch of the event, this is 44mm, steel, and equipped with the P.9010. Limited to 150 pieces, this is priced at US$8100 or S$11,600. 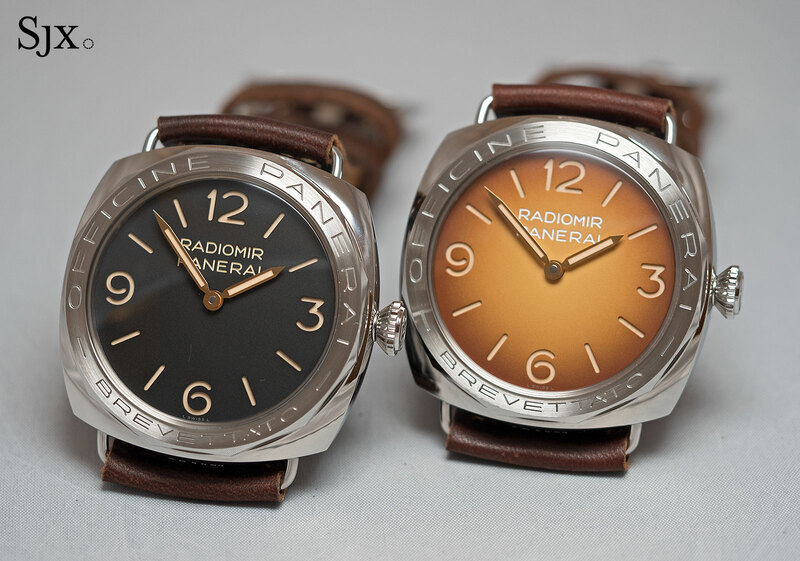 And the final two watches are remakes of vintage Radiomir watches first announced last year. 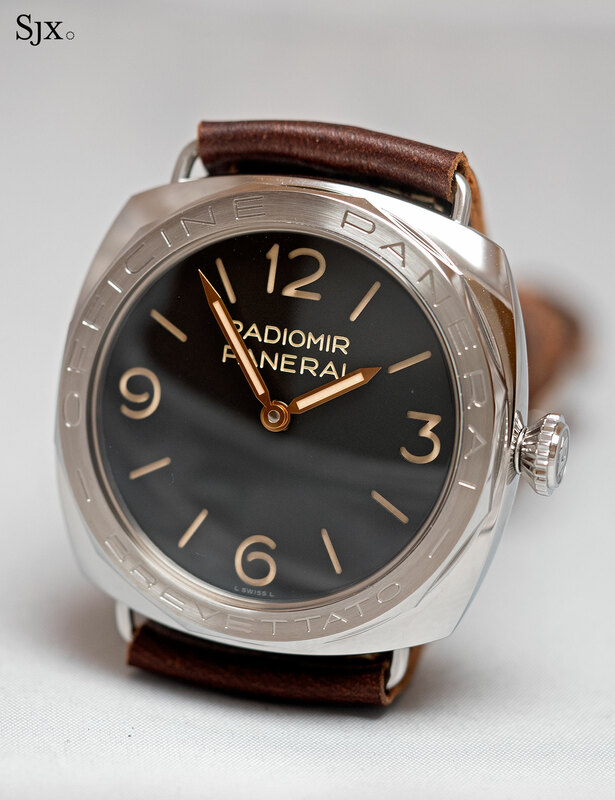 The Radiomir 3 Days Acciaio PAM00685 and PAM00687 are based on 1930s ref. 3646 prototypes with 12-sided, screw-on bezels. 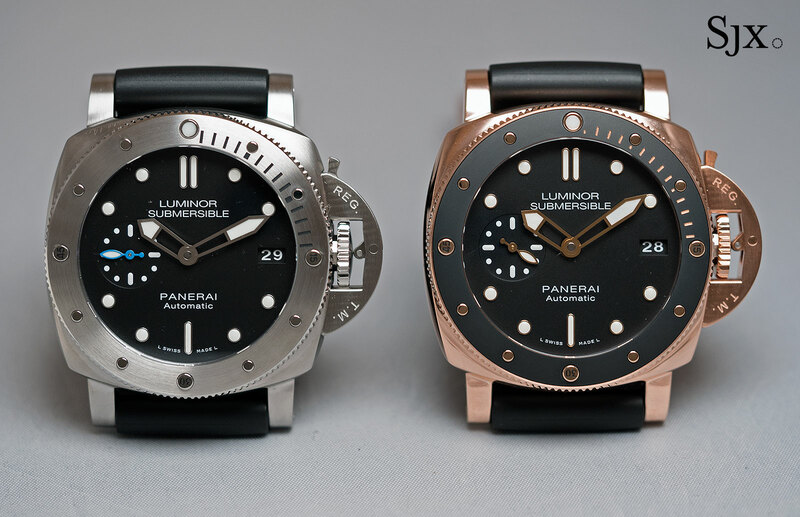 The PAM00685 a traditional black dial, while the PAM00687 has a graduated caramel dial that mimics the look of faded “tropical” dials found on vintage Panerai watches. Both are powered by the P.3000 hand-wound movement. They are each limited to 1000 pieces and cost US$9800. Update February 6, 2017: Singapore dollar prices added.